Rapid development of new radionuclide agents in imaging and therapy has led to clinical translation of agents such as 177Lu-DOTATATE (treatment of neuro-endocrine tumours) and 223Ra (treatment of metastatic prostate cancer), while new chemistry is being translated involving alpha and beta emitting radionuclides (213Bi, 90Y, 177Lu, 67Ga etc) with tumour specific compounds such as PSMA, Herceptin and nanoparticles (eg radio-embolisation). Although Radiation Physics implemented in computational dosimetry has a long standing contribution to radionuclide theranostics (eg MIRD), it has yet to be applied onto small scale dosimetry models to take into account cellular and sub-cellular distribution of the radiopharmaceutical. Such models will help attribute energy release (thus far described by the dosimetric unit of Gy as absorbed energy per mass unit accountable to the whole organ or tissue section) into more accurate micro-distribution of dose. To achieve this, both the tissue range of absorption (particle range) and the functional site of absorption (i.e. specific micro-site of energy absorption within the cell, organelle etc) should be defined. This will be pivotal in determining the potential of new radionuclide agents in clinical MRT translation. For example, Auger emitting radionuclides have been proposed for theranostics, however their detailed dosimetric profile is not well understood as particle range (micrometers, energy <10eV) is incompatible with traditional dosimetry based on entire organ or tissue section. Accurately defining the micro-dosimetric profile of Auger radionuclide agents within the cell will establish the potential for translation in clinic e.g. for treatment of circulatory tumour cells or micro-metastasis where the advantage of short-range dose within target cells offers unprecedented benefits while avoiding irradiation of normal tissues. Computational modelling is typically addressed by Monte Carlo techniques to follow the trajectories of large numbers of emissions and their interactions with matter within the biological target based on the radiation physics processes. One suitable platform is Geant4-DNA originally initiated by the European Space Agency/ESTEC. This allows modelling of early biological damage induced by ionising radiation at DNA scale. Computational micro-dosimetry will include simulation of physics processes in liquid water and other biological materials, chemistry processes for water radiolysis, molecular geometries and quantification of DNA damage. In addition, computational models may be scaled up making use of the in vitro and in vivo animal studies (some ongoing within the School) to derive dosimetric predictions for the potential translation of new therapy agents to humans. Potentially this work may lead to proposing correction factors for organ based patient dosimetry while overcoming assumptions of uniform distribution across the entire organ. 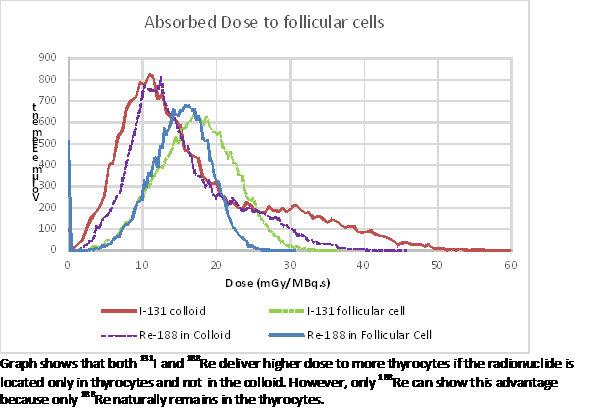 The described in silico micro-dosimetry may inform current models and provide improvements based on particle-specific adjustments at sub-cellular level. Establishing such enhanced models will allow translation and optimisation of therapies for the specific radiopharmaceutical. Translation of MRT agents currently relies on defining maximum injected activity delivering bone-marrow dose < 2Gy - a limit derived from external-beam radiotherapy which may vary across different particle emissions but also for short-range emissions might not be relevant.